Dental technology is rapidly advancing, and you want to make sure your dentist in Mesquite stays on top of the latest developments. Dr. McKnight regularly invests in state-of-the-art tools and equipment for our dental practice to help ensure that you are always receiving comfortable and efficient dental care. 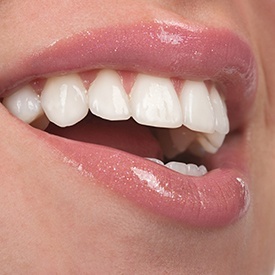 Whether it’s a high-quality image with an intraoral camera, digital X-rays, or one of our specialty treatments, you’ll love the level of care available at our modern dental office. Sleep apnea is a considerable problem, affecting some 20 million adults in our country every single night. This sleep breathing disorder causes chronic snoring, fatigue, and a host of other issues that can severely impact your overall health. 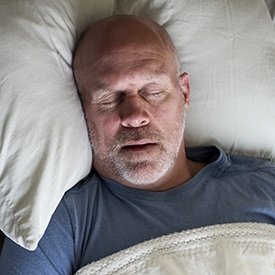 Did you know your dentist can treat sleep apnea to help you sleep soundly through the night once again? Find out more today. The TMJ, or temporomandibular joint, is a network of bones, ligaments, and blood vessels that allows your mouth to open and close smoothly. It’s at the base of your ear and upper back jaw— and when the TMJ functions properly, you probably don’t really notice it. But, if you have misaligned teeth, have experienced facial trauma, or are under serious stress, you may develop TMJ dysfunction. 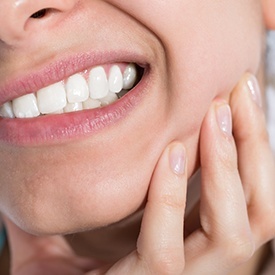 A clicking, popping jaw can develop as a result — but Dr. McKnight provides treatment for a painful TMJ. Many adults struggle with dental fear or anxiety. 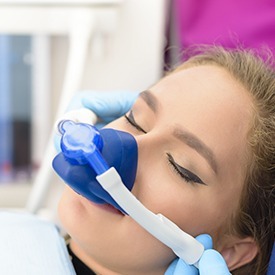 When those jitters get in the way of their willingness to receive routine or necessary dental care, it’s a problem — but sedation dentistry can help. Dr. McKnight offers oral and IV sedation for patients dealing with mental or physical barriers to dental work. Accucam is a wonderful tool that allows us to show you what is going on inside your mouth in up-close-and-personal detail. Our little handheld mirrors can only do so much when it is time to explain a treatment plan to you — and that’s why our intraoral camera is so valuable. It’s easier for Dr. McKnight to communicate your oral health needs with the intraoral camera, and you will find it easier to ask informed questions, too. 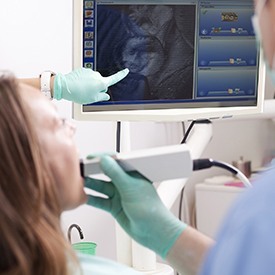 X-rays are an important diagnostic tool in any dental office. They let us see potential problems that could be lurking beneath the visible surface, like root decay or the presence of extra teeth beneath the gum line. Traditional radiography requires the use of chemicals and longer developing time than is necessary in the days of digital dentistry. 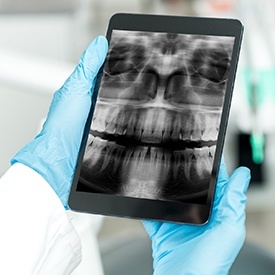 With digital X-rays, we can capture images of your smile quickly and easily — all while reducing radiation exposure for everyone. Early detection is crucial for providing conservative treatment for any oral health hazard. And when it comes to tooth decay, catching it early can actually help us reverse the effects and prevent the need for a filling altogether. Dr. McKnight uses DIAGNOdent, a decay detection tool that makes visible small lesions or weak spots on the tooth enamel that would be invisible to the naked eye — and which might not even show up on an X-ray. If you’ve ever had an impression taken with dental putty, then we guess it wasn’t exactly your favorite experience. Thankfully, modern-day dentistry now allows us to do this digitally. 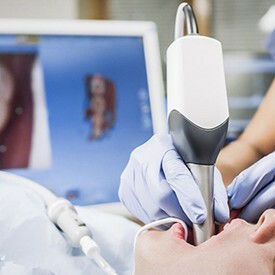 With our iTero Scanner, we can quickly and comfortably create a completely digital impression of your teeth and keep the putty safely locked away. This process is faster, easier, and also creates a more detailed impression, improving the quality of any treatment it is used for.